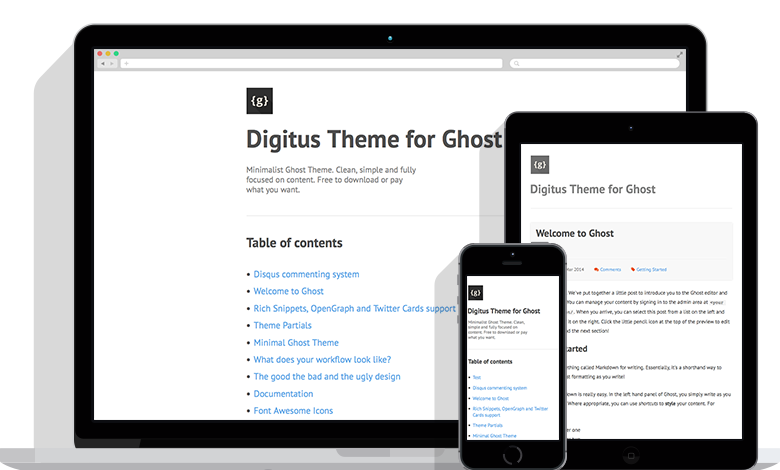 Minimalist Ghost Theme. Clean, simple and fully focused on content. Free to download or pay what you want. Engage your vistors. Let them comment on your blog with Disqus commenting system. Keep track of your blog visitors by using Google Analytics service. Share your content on social media services like Twitter, Facebook and Google+. With support of Twitter Cards and Open Graph protocol. With fitVids.js your embedded videos from Youtube or Vimeo are now fully responsive. The complete set of Font Awesome icons are included. With CSS classes ready for use.